Sensational Gor Mahia lead striker George “Blackberry” Odhiambo is the KPL 2010 Kenyan footballer of the year. This was announced at a colorful KPL award gala held at the Safari Park hotel in Nairobi on Wednesday evening. Sports minister Paul Otuoma presided over the ceremony that saw KCB’s forward Ezekiel Odera named best upcoming footballer. 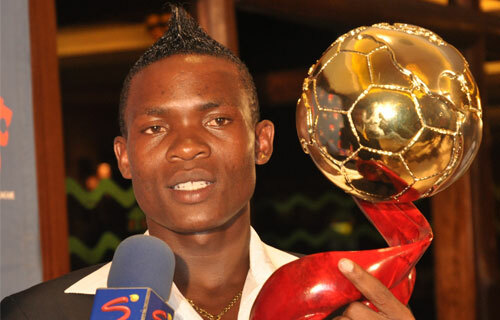 Ulinzi captain Stephen Ocholla was runners up in both the Footballer of the year and midfielder of the year categories. George Odhiambo was quick to thank his fans, KPL and Super sports for the good season. “I am happy to KPL and more so to Super sports for bringing to Kenya good football and to fans of Gor Mahia I say thank you for your support. For where am going, I will keep Kenya ahead.” Said George Odhiambo. Ulinzi’s Geoffrey Kokoyo bagged the best defender award while Anthony Kimani of Sofapaka was named best midfielder. Last year’s player of the year John Baraza again walked away with the golden boot award for the second year running. Western Stima were the most disciplined team while Champions Ulinzi produced the coach of the year, Benjamin Nyangweso. Long time soccer loving fanatic Isaac Juma was awarded with the Chairman’s life time achievement award for his outstanding unwavering support to Kenyan soccer. The award was accompanied with a 100 thousands shillings cash award. All the winners in each individual category walked home with a handsome 100,000 shillings except for the best player's category which was pegged with a 200,000. Runners up in each individual awards pocketed 75,000 shillings while third placed were rewarded with 50,000 shillings. 1. Francis Ochieng (Ulinzi Stars). 3.Torome Tirike and Paul Muchiri. Most disciplined club- Western Stima.